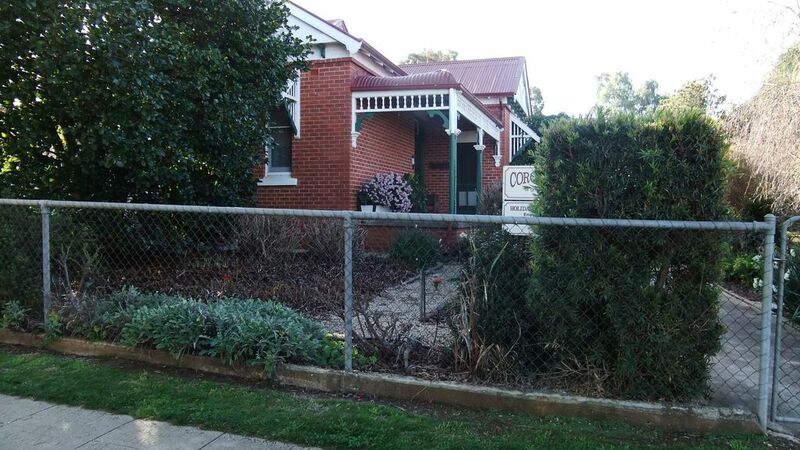 Coromandel on the Murray is a beautiful over 100 years old Red brick house with all the features of the time. It has all the mod cons you would expect, including reverse cycle air conditioning, but still has the old world charm , and also has a lovely rotunda with power and BBQ. A secure yard with an excellent garden and off street parking. The RSL Club is only a short walk away where there is plenty of entertainment is available. The wineries of the region are a few minutes away and the Corowa Chocolate and Whiskey factory[enjoy a meal or snack] is only a few blocks away as is the main street of Corowa. Enjoy a game of golf at the Corowa Golf Club's 27 hole course. Go fishing or boating on the Murray. Beautifully presented period home set in stunning gardens. We had a relaxing time reliving influences of our past in the warm feel of the era of my childhood visiting grandparents and the family home of my childhood... similar in many ways to Coromandel. WOW ... was what we thought as we stepped through the door!!! What a lovely lovely place to stay!!! The whole place was comfortable and had everything needed for our stay. The beds were very comfortable (something that is missing in a lot of places we've stayed!!) and warm and cosy. The heating was brilliant and the feel of the place was very homey. Wandering around the garden was relaxing. The decor of the home is very fitting for the age of the property - so many little bits and pieces to admire. We would most definitely stay again, an absolutely perfect property. We thoroughly enjoyed our stay in this charming Federation home with lovely garden. Close to RSL and the centre of town. Easy access to the RSL club and superbly decorated double bedrooms. The house was very cold upon arrival but we soon had all heaters on. The built in veranda to create space for single beds was a little out of character with the federation style of the rest of the house and with only one bathroom, those occupying those beds had to walk through either of the double rooms to get there. Very comfortable and well appointed. Facilities were inadequate for the number of beds (8). Only one bathroom. The "federation" style kitchen resulted in poor food preparation area and small washing and refrigeration facilities. Tariff miscommunicated.